La Virgen bosnia de Medjugorge ya tiene un lugar de peregrinación en España o al menos “un lugar perfecto para encontrarse con la Virgen” según las palabras del sacerdote, José Antonio Mérida, pronunciadas hoy en el acto de apertura de la plaza ajardinada dedicada a La Gospa (Madre), como también se conoce a la virgen bosnia. Desde las 11 horas de hoy y en pleno centro del campo de golf de Rojales, la plaza citada acoge una talla de la virgen, replica exacta de la original, de un metro y 60 centímetros de altura, realizada con el mismo tipo de piedra y tallada en Bosnia-Herzegovina. En un emotivo acto, los sacerdotes José Antonio Mérida y Patrick…….? procedieron a la bendición de la plaza religiosa llena de simbolismos y de signos, “un trozo de Medjugorge en Rojales”. Magnus MacFarlane-Barrow from Scotland is the founder of the humanitarian organisation Mary's Meals. It was in 1983, that he discovered Medjugorje and that was what changed his life as well as the lives of his parents. During the war in Bosnia and Herzegovina, Magnus began to bring the humanitarian aid which eventually grew to the establishment of the humanitarian organisation Mary's Meals. This organisation reached in 2015, the number of 1.035 637 children who have everyday meal in their school in the poorest countries of the world. Magnus received several international acknowledgements for his work. He said that this apostolate of Mary’s Meals was not initiated with the purpose of becoming famous: „I am not interested in the success in the eyes of the world. I believe we should all try to become successful in the terms of our own holiness. That has nothing to do with becoming world famous or with performing some obvious, dramatically good deeds. It is all about faithfulness, with our vicinity with God and our decision for Him to be at the first place in our lives“, said Magnus who gave a testimony at the Youth Festival last year here in Medjugorje: „I really like coming for the Youth Festival each year. There are many beautiful things every year, but also some new ones. The Youth Festival thrills me each time even though I know many people who converted here and whose lives we changed here in Medjugorje. There are so many fruits coming from this place. We all need messages of Medjugorje even though those aren't anything new, those messages are from the Gospel. Our Lady is inviting us to return to that message of Gospel. We need that call, it is return to Her Son, therefore I find it so inspiring to come here and to see so many young people praying on their knees before Jesus, as that is what the world needs now so much“. In the period from January 15-17, 2016 around twenty girls from the various parts of Herzegovina participated at the seminar held in Domus Pacis in Medjugorje, organised by the Franciscan School Sisters from Mostar. The leader of the seminar was Sr. Danijela Brekalo, and girls spent time in prayer, everyday celebration of Holy Mass, Adoration of the Blessed Sacrament and prayer of the Rosary with meditations on Apparition Hill. One of the participants said: „I became aware of myself and how much God loves me and how He gives me all in the right time for me. Besides talking to my dear sister, what really helped me were lectures on love, prayer of Rosary, Holy Confession and Holy Mass, as well as e time on Apparition Hill. I would like to encourage all those who are reading this to pray to God in the days of joy, but especially in the days of sorrow and pain, as that prayer is really answered in the best way. Also, be patient, God is not going to do something at the time when we want, but exactly at the time best for that and trust me, it is always better than anything expected. I would like to use this occasion to thank Francsican School Sisters from Mostar who are conducting such beautiful and amazing retreats. Also, all those who feel desire or need to experience something like this, I would like to advise to do that as you are certainly not going to lose anything, but in return will gain a lot“. On Thursday, January 21, we will commemorate the fourteenth anniversary of death of former Medjugorje parish priest and the founder of religious – humanitarian organization “Medjugorje – Mir”, Fr. Leonard Orec (born in Posuski Gradac, 1928 – died in Zagreb, 2002). Fr. Leonard served in Medjugorje from 1988 to 1991, in that period he served as a parish priest for more than one year. During those three years, he indeed left a permanent mark as a wise and experienced priest, and fervour promoter of Our Lady’s messages of peace and reconciliation. 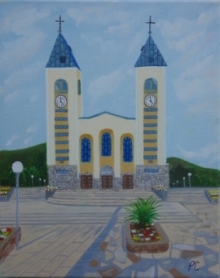 In 1992, he established humanitarian association “Medjugorje – Mir”, that is still active. Since 1997, Fr. Leonard was active in the General Curia of the Franciscan Order in Split, until 2001, when he got seriously ill. It was in those last days that he had celebrated his 50th Jubilee of Priesthood and then he died in Zagreb on January 21, 2002. He was buried on January 23, in Posusje.